Just when you know a place, it still has the capacity to surprise. I was so delightedly shocked when Kenny revealed that Metro West, the sad-sack largely deserted shopping mall on Paisley Street, actually concealed a Nepalese restaurant. Fancy that!! 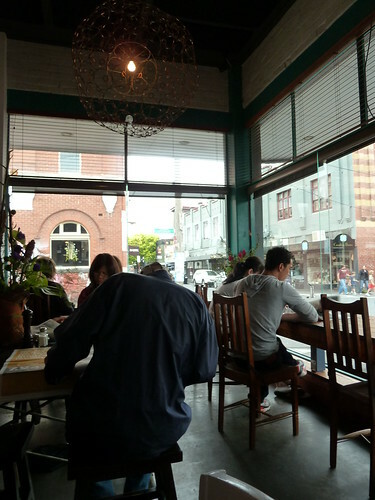 In this small cafe, there's a menu filled with intriguing Nepalese dishes like tass or goat with "rice bubbles". "We only have things on that side of the menu because the chef is not here yet," said the young woman at the counter. I nervously flipped the menu over to find the standard Aussie sandwich menu and immediately assumed she meant the boring sandwich side, but on questioning, no, she could make all the Nepali classics - the chef had to be present to make the burgers and bacon & egg rolls. Such a subversion of expectations! We waited about 20 minutes and the kids took great delight running in circles in the Metro West twilight zone. The hanging plants make me think of an alien attack by triffid-like beings. 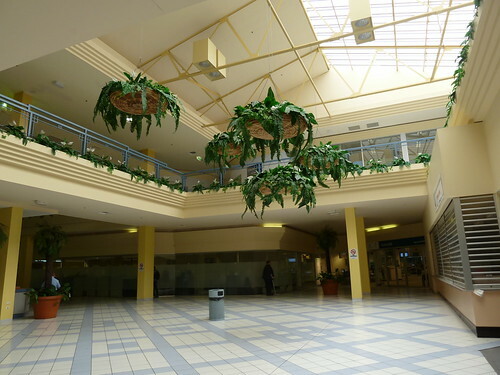 A deserted shopping centre is a strange place. 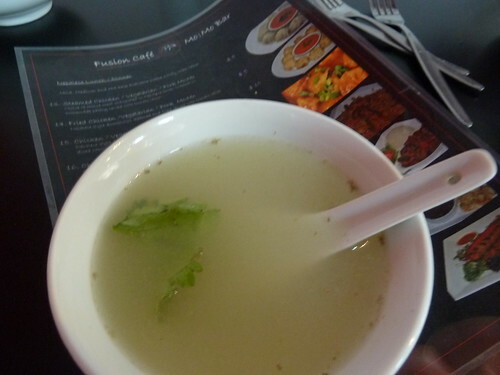 Quite nice chicken broth served complimentary to start - unfortunately rather lukewarm. The kids liked it. Sandwiched between India and China, it stands to reason that Nepali cuisine has hallmarks of both countries. These momo dumplings were pretty unreal - handmade pastry around a super-juicy chicken filling with heaps of fresh ginger flavour. 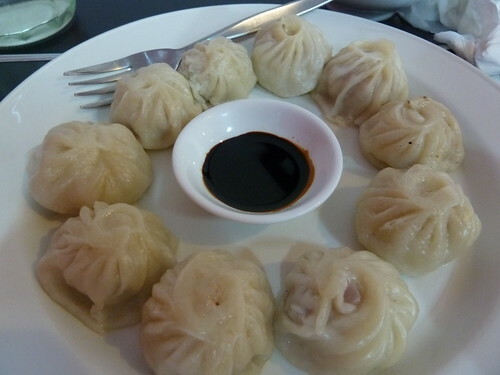 They were reminiscent of a more rustic xiao long bao. Dipped in a little thick black soy - delicious! Also delicious were the vegetarian option, filled with a soft grated carrot and cabbage filling, lightly spiced. The same pastry has this time been fried to golden, crispy perfection. 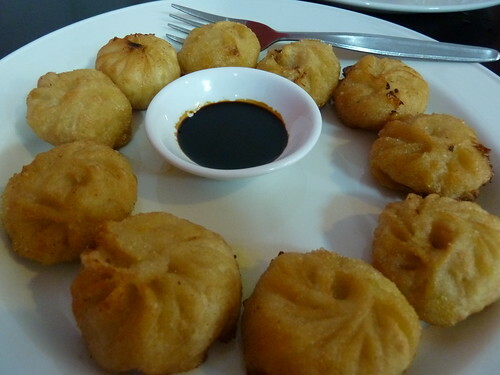 These also came with a small dish of traditional hot chilli sauce which was quite nice, orangey-red and very spicy. The chow mein had been highly recommended via Kenny's blog so we had to give that a shot. 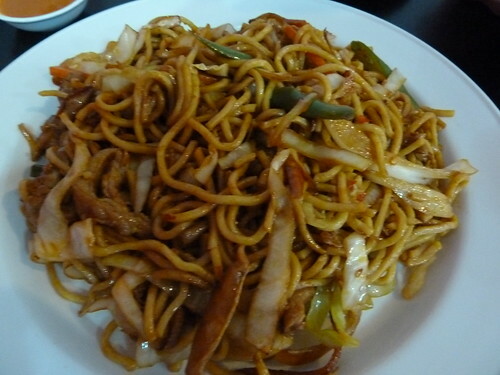 "Chow mein" is very popular as an Indian-Chinese dish, which are Indian interpretations of perceived Chinese classics. I really love Indian-Chinese food as unlike Australianised Chinese food, the Indian palate's love of chilli and spice means that the direction the basic Asian flavours have been taken in is vastly more interesting than the bland, sweet versions of Aussie Chinese. Chow mein is not my favourite Indian-Chinese dish, basically because it tastes a lot like my own approximations of Chinese noodles. The flavour is there but not the wok hei and the certain je-ne-sais-quoi that Chinese or Malaysian fried noodles have. Nevertheless, I did enjoy this tangle of egg noodles with well-cooked chicken, vegies, chilli and soy sauce. Check out Kenny and Bennie's adventures at Fusion Cafe here and here. They have a momo loyalty card - buy six, get one free. If you want to try your hand at making Nepalese food at home, stop into Spice Zone at 4/68-82 Hopkins Street in Footscray for a range of Nepalese spices and dried vegetables. In the course of my work I have come across a thing called "mindfulness meditation" which intrigued me. I asked a friend what it meant and she said it is trying to focus on being in the moment. All my life a chronic multitasker, cleaning the kitchen while listening to talkback, knitting furiously while watching TV, as I get older I find I am having some sort of sensory overload. While the weekends used to have the soundtrack of PBS from morning til night, now they are a slapstick comedy of me shutting off the radio every time I walk past, while my husband and kids turn it back on. Doing too many things at once makes me stressed out while I once thrived on it. So perhaps I am tuning in to this form of meditation without really realising it. The other element of mindfulness meditation is being very much sensorily aware of what you are doing - not just listening to birdsong and feeling the wind in your hair but also the feeling of the warm water and the soap on your hands when you are doing banal daily tasks. This is somewhat hard to achieve when cleaning poo out of the carpet but I think being fully present in all five senses is a noble quest. It's probably hardest when eating. A boss once laughed at me, eating lunch while reading Epicure - "how much food can one person handle?" and indeed, giving up reading when eating is probably the hardest thing if you want to be fully present in experiencing your food. 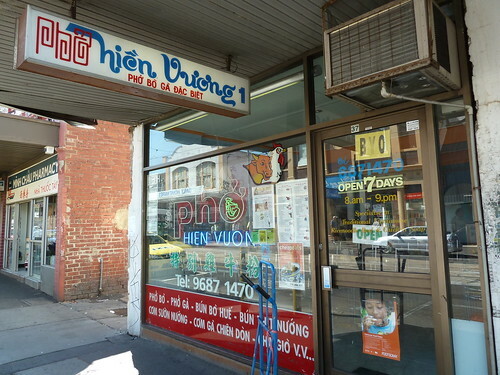 Vivienne wrote to me recently asking if I'd tried Hien Vuong's pho. "I think their sliced beef and chicken pho is probably the best in Footscray," she said. "The owners are really nice too, it's a family run business and there's usually a bunch of kids in there." I had been lucky enough to try Hien Vuong's pho a while back and had gone for my usual sliced beef so when the craving struck, I knew just where to head. Love this place - so old school. Everything is sparkling clean in a houseproud way. 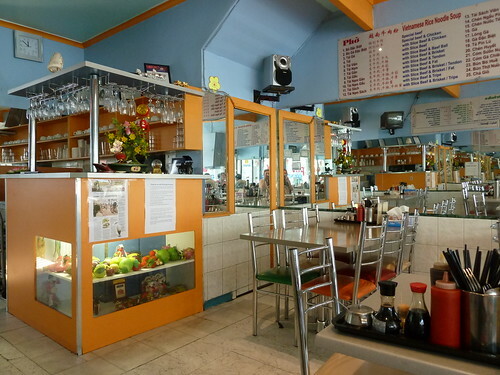 The owner comes over the minute you sit down in that classic Vietnamese restaurant way - it's because it's assumed you came here because you had a hankering for one specific thing, rather than wanting to browse the menu, which of course is okay too! For vegies, there's hu tieu chay or Vietnamese vegetarian noodle soup. 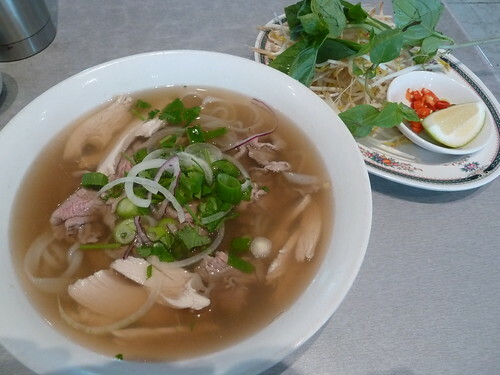 I am not very adventurous with pho - I have had a chicken pho just once and constantly refer to pho bo tai or sliced beef pho, where the wafer-thin raw beef slices cook almost instantly on contact with the hot broth. True to Vivienne's rec though I opted for the mixed beef and chicken. This was awesome - the beef perfectly sliced, tender and tasty, the chicken well-poached pieces of breast meat. While some pho broths have a really marked undertone of whole spices, this broth was really aromatic with fresh herbs, scattered with onion and coriander. Does anyone know if they mix the two broths for this mixed pho? In any case, it was fantastic - the warmth and soothing nature of chicken broth combined perfectly with that clear, cleansing yet hearty beef broth. Hunched over your bowl of pho, there really is no choice but to be in the moment. It's impossible to wedge a book under the bowl and if you were able to, it would be splattered with stock in a second as you slurp up your noodles. The steam in your face, you contemplate the noodles and the flavours and textures just jump round your mouth. The sweat from the chillis begins to pour out and you get that tropical hot food feeling, outwardly hot but refreshed inside. For ten minutes, I was nowhere else but in the moment. When I stepped out onto Leeds Street, I felt as centred and calm as after a massage. Pho as meditation - for a food junkie, that is the one for me. I loooooove getting your emails and tips - please keep them coming. I keep them all in a little book and absolutely intend to work through them all so if I haven't been to your favourite place yet, I will soon! It all depends on what I feel like eating that day. Feel free to send me a reminder, though!! People bag the suburbs but I love them - they are so full of surprises. Finding a "secret" bakery or food shop nestled in some run-down shopping strip in the boonies puts me on a high for the rest of the day. So where else for gorgeous Polish crepes than in an industrial estate in East Keilor? 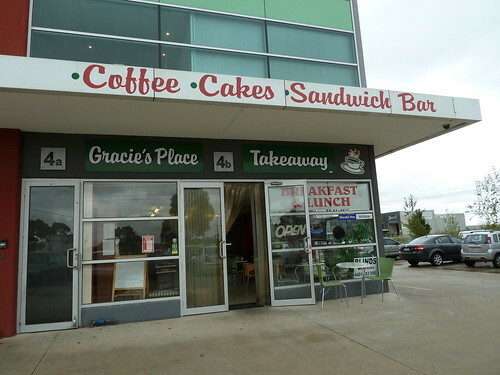 Gracie's Place is your classic tradie lunch stop with sandwiches, some hot food and a few intriguing Polish items on the menu. The two Polish ladies who work here are gorgeous. I couldn't see any pierogi on the menu so I asked if they had any. "How many you like?" said the lady - "Oh, I don't know, maybe six?" I replied. She came back with six bags full of frozen homemade pierogi. "You having a party?" she laughed. We worked out I wanted six pieces, not six bags (although there's always next time ;) and pierogi safely stashed in my bag, I turned my attention to the Polish crepe. This was soooo fantastic. 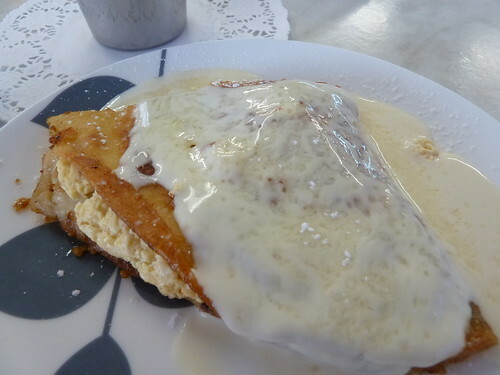 The crepe was thick yet delicate with those lovely, crispy edges that only come from being fried in butter. It was stuffed with "cream cheese" that was quite like ricotta, scented with cloves and tangy with lemon. With cream and icing sugar - divine. 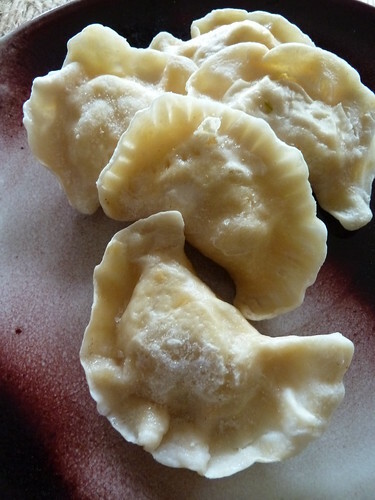 Time for main course - home to cook up these lovely homemade pierogi. 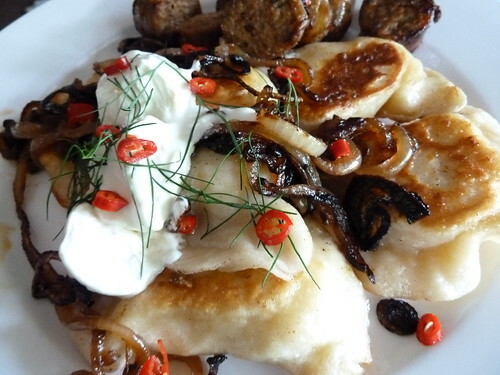 We eat a lot of these in Chicago, where the Polish community is quite big. The supermarket sells them frozen in a huge range of flavours. We would fry cabbage for a long time until really soft and crispy and put the pierogi on top with vinegar and sour cream. Mr Baklover panfried them (they had defrosted a little on the way home) and served them with sausage, fried onion, sour cream and dill. The filling was sweet, creamy mashed potato. Delicious - but that crepe took the cake. For more cake love, you may like to read my article for SBS Food on Adriano Zumbo and his Easter egg macarons at the recent SBS Food Journey Festival. Thank you SBS for the opportunity! As residents of the inner west, it's a common lament as to how divided the rest of Melbourne can be from us. My friend recounts the story of how, attending a family function in St Kilda, the aunt or uncle got up and (despite the fact that other relatives had come from Warrandyte and beyond) said, "And we are so happy that [name] could join us, who has come alllll the way from Footscray!" Erm, it is 15 minutes over the West Gate. Yet conversely Footscray residents can be oddly proprietary of our suburb, saying they want to keep it a secret and "keep everyone out". Spread the love, I say, which is why I was so excited to see so many Melbourne Food and Wine Festival events happening in and around Footscray. One I was particularly looking forward to was the Bo Bay Mon, a seven-course beef-focused Vietnamese feast normally reserved for weddings. 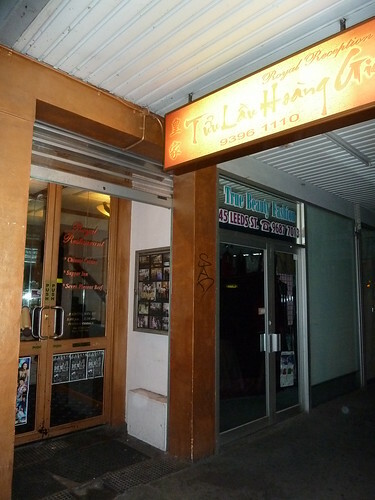 It was held at Tuu Lau Hoang Gia or "Royal Reception", a restaurant I had hitherto never heard of, above the shops in Leeds Street. I couldn't get a good pic inside as it was quite dark and I dislike using my flash (I think it disturbs others' meals) but I think this is more an "events" venue, eg, for a wedding reception. It's quite small but has a dance floor and lights, plus they apparently do karaoke. There was a full Vietnamese/Chinese menu but also a separate banquet menu with multi-course seafood banquets priced for 10 people or more. Indeed, there was a huge tank of seafood inside with very healthy-looking lobsters and mud crabs. Unlike most Vietnamese restaurants in the area, they are fully licensed, but it has to be said - the wine prices are absolutely outrageous - the only sparkling wine is Passion Pop for $30. I am not kidding! 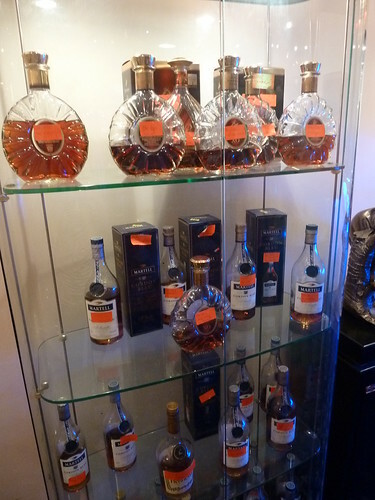 Evidently the drink of choice is cognac and upon entry, there are two of these glass cases filled with cognac bottles with the names of patrons stuck to them. Obviously you can buy a bottle and keep it here for next time you come. I am really curious about this place - if you know more, please tell me! 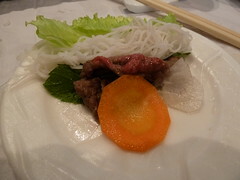 Course number one bounded out of the gates - wafer-thin beef slices which we cooked ourselves in the hot, vinegared water before rolling up in rice paper with vermicelli, vinegared vegetables and fresh herbs. The sauce was quite delicious - I believe it was mam nem which I have had before and disliked - it's made from fermented shrimp paste and is really, really stinky. This must have been toned down as it was only a little fishy but very tangy and sweet, perhaps from tamarind or pineapple. The best - so simple, fresh and healthy. If you want to make these at home, they are so easy. You can buy the rice paper in Asian grocers - they come dry in packets and you just dip into hot water to rehydrate them. The rolling takes a little practice. You can fill them with anything, really. Make a sauce by heating then cooling hoi sin, peanut butter and a dash of milk to thin it out. Yummy! Next course - "BBQ beef". 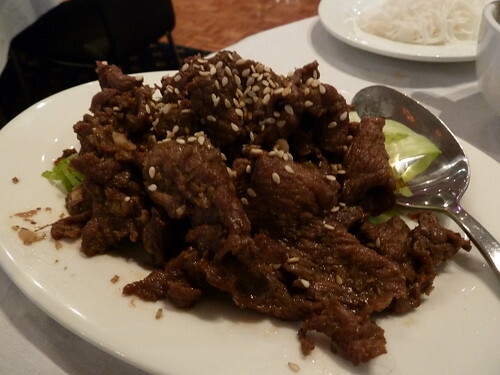 This was the same thin beef lightly cooked with a hint of cumin, perhaps. I found it a bit underseasoned but it tasted great in the rice paper rolls. Courses three, four and five came together - beef in betel leaves, "beef skewers" and "beef in pork fat". I normally love beef in betel leaves (often written as "beef in vine leaves" on menus). Betel leaves are used in India to make paan, a mixture of areca nut which is a mild stimulant and various aromatics around which the betel leave is wrapped. It is then chewed and the nut stains the mouth and teeth red, pretty much permanently over time. Don't be scared to eat the leaf, it's the herbal filling that is the addictive, stainy part. I didn't like these much as I actually prefer my beef in betel leaves to be quite thin and have lots of leaf and not much beef (see here). These were the opposite but perhaps this would be considered better in Vietnamese culture for a feast, ie being more generous with the meat. The beef on skewers I think was treated with bicarb as they were beef pieces but were very, very soft - I wouldn't have minded more "chew" and more charred flavour. 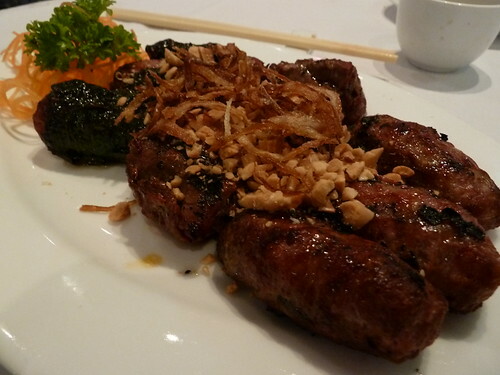 The "beef in fat" I think was bo mo chai which is minced beef wrapped in pork caul fat. I found these a bit plain and by this stage I was beefed out. What did you expect, you say? I know - I don't really eat that much meat and was having a hard time eating so much without any accompaniments (we had eaten all the rice paper and herbs by now - not sure if we were meant to have saved to wrap these items). As always, this is just my personal reflection. If you were a big meat-eater, I'm sure you would have been in heaven. 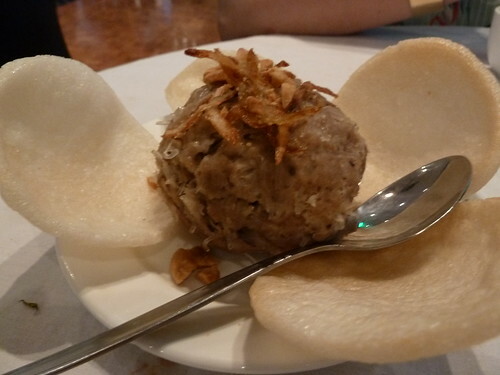 Steamed beef meatball with glass noodles and wood ear mushrooms. This was very nice, very soft and juicy but I couldn't eat any more meat! The last course, beef congee. 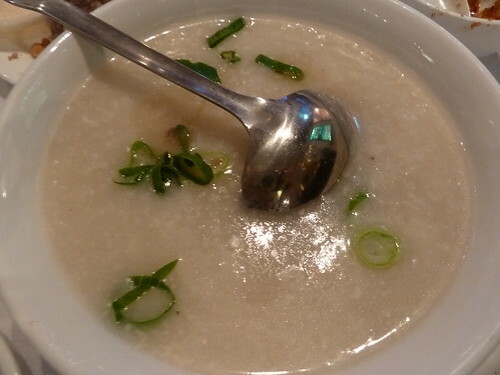 I must say I am not mad about congee so only had a spoonful or two. The maitre d' was lovely and was concerned we didn't eat much of the last two courses. I explained that I love all the pickled vegies and fresh herbs of Vietnamese cuisine and didn't enjoy the meat-heavy, rich style of the last few courses. But that is the thing - this is a traditional wedding banquet. In rural Vietnam I would imagine to kill a whole cow or buffalo would be quite a significant sacrifice and without refrigeration, you would need to eat as much of it as possible, as quickly as possible. So I imagine this was quite authentic. 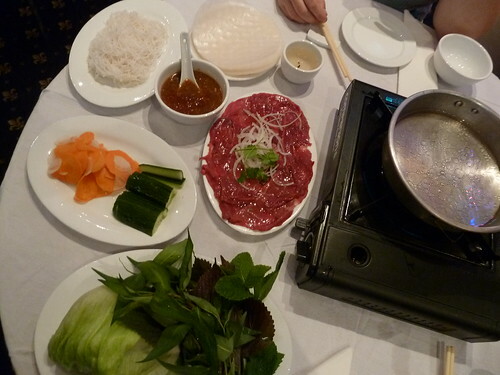 Despite my own personal preferences, it was a privilege to try something so traditional that many non-Vietnamese Australians would never have a chance to do. I look forward to many more Food and Wine Festival events in Footscray in the coming years - we have so much to offer. Can you believe that only as recently as 1995, the Sun Theatre was a run-down heap? It had been the height of sophistication in 1938 when it opened as a single-screen 1080 seat cinema but had declined over the years, finally being shut down in the 60s or 70s for unsanitary carpets! See history here. 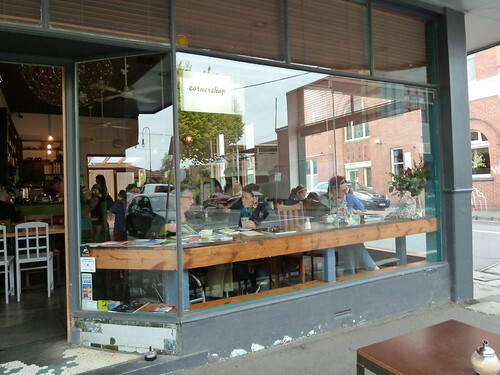 Now it is arguably the heart of Yarraville village, which is such a gorgeous destination for leisurely strolling and latte sipping, and my favourite place to do the latter is Cornershop. 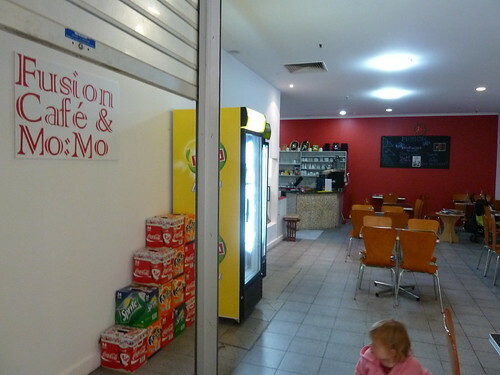 I don't think the western suburbs has one cafe that you wouldn't feel comfortable in in your trackies. Cornershop is no exception. It's cool without being snobby in the slightest. I love all the hodge podge furniture which is retro without being grotty. Latte love! Cornershop use Coffee Supreme which is such a great blend, actually chocolatey in flavour. 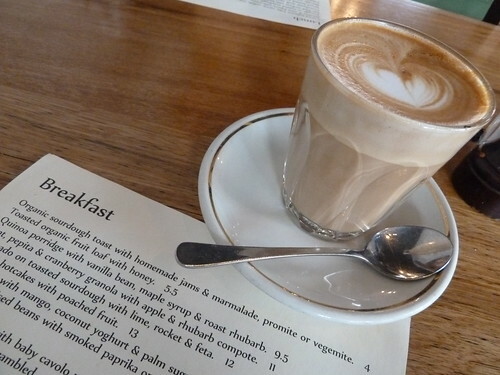 The coffee is served at the proper latte temperature which is somewhere between warm and hot. 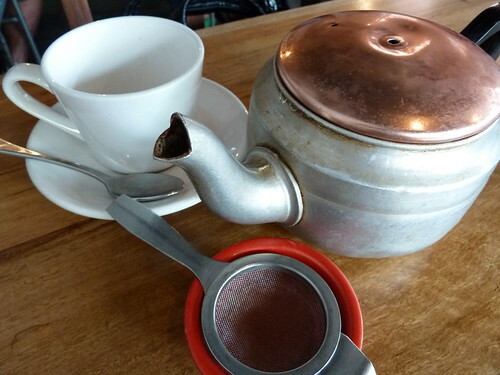 My only gripe with this is sometimes when you get takeaway, because the t/a cup is cold, it cools too fast. Ms H always gets this - "just fresh and simple" is how she describes it. 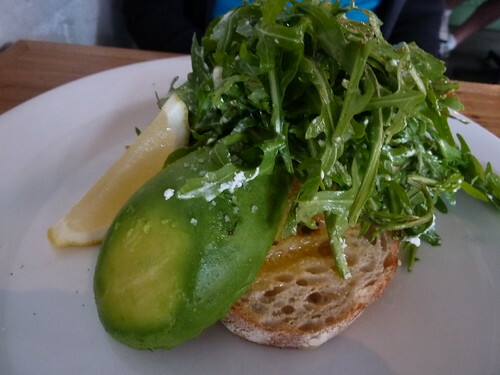 A tangle of rocket with a light feta dressing piled onto good bread with a single fat avocado cheek. This was so great. Mild salami contrasted with the strong, bitey asiago with surprisingly quite mellow rocket. The bread was perfect with a crispy, toasted shell and soft bubbled interior. FYI they did not do this wanky sandwich sculpture, that was my crude attempt at food styling. Jasmine and green tea - obviously quality, so fragrant. We did not drink it fast enough for it to overbrew and become too tannic, unfortunately. Love this cafe - they make great coffee, the prices are reasonable and it still feels like the cafe on the corner. They also apparently participate in the Ground-To-Ground program, which means they are happy to give you their used coffee grounds for your garden - they are an incredible source of nitrogen - keeping more green waste out of landfill. Didn't need another reason to love them, but I do all the more now! Don't forget Plan International's 'From Cup to Crop' challenge is on from Mar 14 to Apr 14. Check out the website for how you can become involved. I pledge to donate $3 per meal I have out during this month - Plan International can feed a child for 10 days for $3. In the gastronomic wasteland of the outer suburb where I went to uni, there were two choices - Subway or Red Rooster. Therefore, Subway (or more to the point, their 6-inch veggie sub, no cheese) did keep me alive for those four years. As a result, though, I can eat no more Subway - the sickly sweet tang of the "fresh baked" bread now makes me retch. 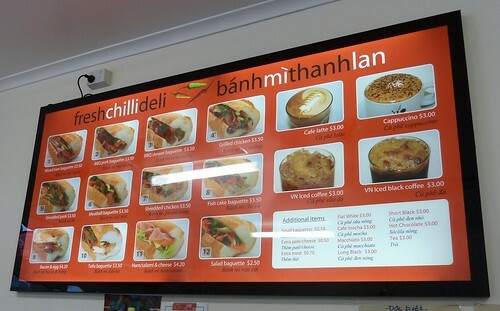 Why would I need to anyway, living in Footscray, home of banh mi, of which Nhu Lan in Hopkins Street is queen? 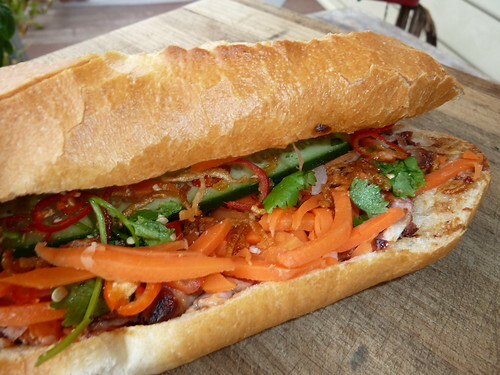 We adore Nhu Lan and they won best banh mi in our recent limited-sample yet highly scientific blind banh mi taste test. That morning I thought it was time, though, to see what the rest of the west had to offer. 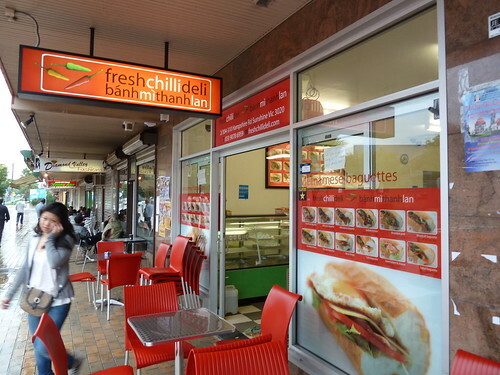 Fresh Chilli Deli started in 2007 in St Albans and now has a new branch in Sunshine. 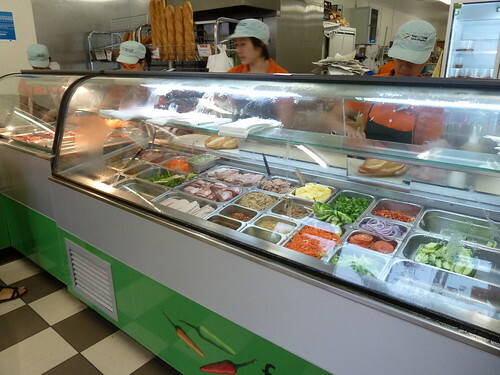 It's a slicker operation than most banh mi shops. Your order is placed at one counter, docket dispensed and then made at another. Choices are your classic fillings with the addition of fish cake (Nhu Lan has fish cake but not on the menu - just ask for it). 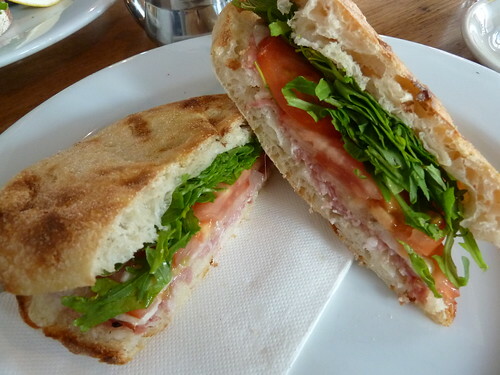 There are also Aussie selections like ham or salami and cheese. If you are scared of Vietnamese rolls because of the long-ago salmonella outbreak in Footscray, please don't be concerned. That shop is long gone and it is like being scared of driving because a car might crash - in fact, the odds are more like flying and a plane crash of you getting sick from a pork roll these days. 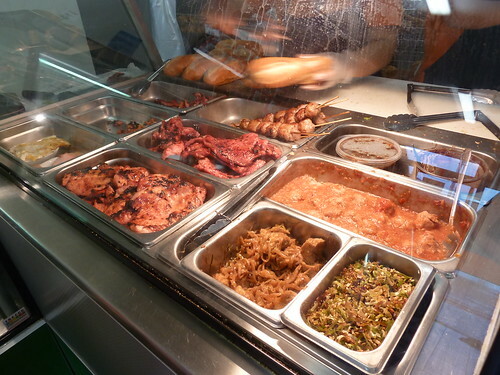 The classic cold mixed ham is actually not my favourite - I prefer the hot meat offerings like BBQ pork or chicken. You can see the pork and chicken fillets here as well as the two varieties of meatball - either in the thick red sauce or the spongier style, threaded on skewers and often called "kebab". 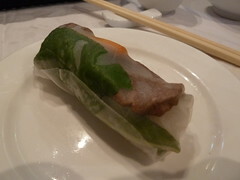 The best part of the roll, though, is the salad - mild pickled carrot and white radish (would be paw paw in Vietnam, I believe), cucumber spear, spring onion and fresh coriander. The crunchy long roll is spread with pate and "egg butter" (special mayo), your choice of meat and its appropriate sauce, then all that wonderful salad. The big thing I liked about Fresh Chilli is the fact that you can have a coffee there - they have an espresso machine and make a quite decent latte, according to my lovely friend C. Coffees are $3 or $2.50 with a roll - brilliant! This iced coffee was fantastic, so strong and rich, like a shot of adrenaline. They do rely on the ice melting to create a long, refreshing drink and unfortunately that day was chilly so it was quite a short-lived pleasure. 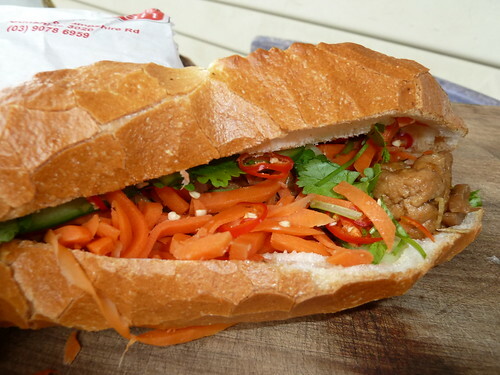 Nhu Lan have a brilliant tofu banh mi - big chunks in a rich, dark sauce. One tofu and one salad is Mr Baklover's standard order so I was pleasantly surprised to find Fresh Chilli did tofu too. I was not mad about this - tofu is tricky to make flavoursome all the way through and I found the centres of these puffs a bit boring. The sauce was thin and light and not what I expected. Mr Baklover thought it was quite nice though. Sorry, this was a bit of an epic fail, mainly because of our expectations. 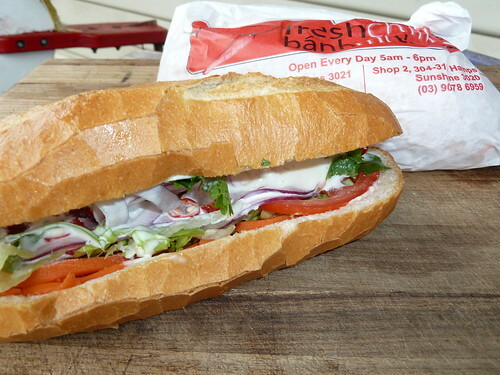 Nhu Lan's salad baguette is a meat banh mi just minus the meat. This was a regular Aussie salad sanger with tomato and red onion and too much thick Aussie mayo. If you wanted a salad sandwich it would be fine but we wanted that real Vietnamese taste. Awesome BBQ chicken though, chopped up small and here, the quality of the salad shone through. Lots of chilli just the way I like it as well as Vietnamese BBQ sauce and little fried onions. Perfection! I think we ordered badly here - I will definitely go back to try the rest of the BBQ meat options as the chicken was a winner and the classic salad fillings were quality and very tasty. I reckon this would be a great spot to bring a friend or family member who wasn't into classic Vietnamese rolls. There's outdoor seating which is great for lounging about on a sunny day. I came past here one day and saw about 15 or so bicycle cops in their fluoro yellow vests, all chowing down on banh mi. True story. That's quite a resounding endorsement! At first the recommendations were simply intriguing. I must check it out next time I am in town, I thought. Then they became somewhat spooky - week after week, people kept telling me to go there. Posts appeared in Google Reader - Coconut House was the only word I saw, the letters seemingly rising from the computer screen, searing themselves into my brain. Finally Bryan and I set a date, and the day we were to go, another friend said, "Let's go out for laksa - I hear there's a great place called coconut something..." "Coconut house!" I cackled maniacally. Seriously, if I was not already happily married, I think that I would have thrown myself into the arms of the cutest waiter I saw, gasping, "The universe has spoken - we are meant to be together!" 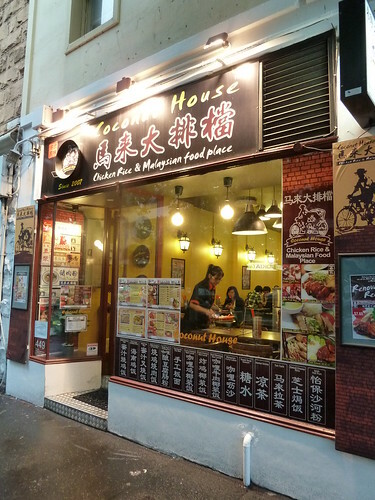 Coconut House is a cheap and cheerful Malaysian eatery that has gotten a rousing thumbs up from food bloggers across Melbourne and after salivating about all Bryan's fabulous eating adventures in Malaysia, I was dying to check it out. It's cosy inside. Ordering is done at the counter and the prices are pretty fab - almost everything under $10. The kitchen is right there in the restaurant, behind the counter and you can see the cooks working as you place your order. It looked a bit haphazard but I had faith. Hey, the universe can't be wrong!? Everyone loves laksa, me included but you can get a bit jerlak of it (Malay for "being sick of eating too much of the same thing" - such a great word!). 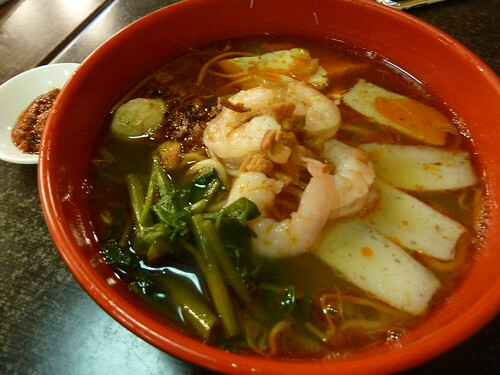 I was curious about har mee which is (to my untrained Malaysian palate) similar to laksa but without coconut milk. I thought this was delicious - the special thing about har mee is the stock made from prawn shells and heads and this version had a fabulous shrimpy flavour. 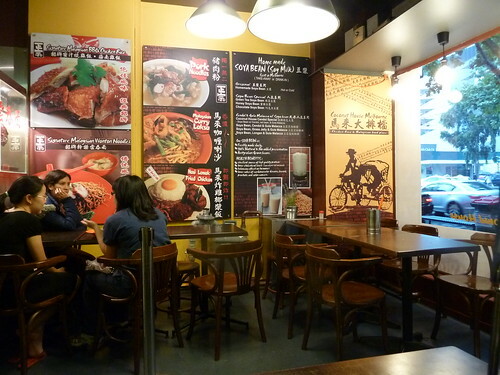 A mixture of hokkien-style yellow noodles and bee hoon or rice vermicelli provided textural variation. The prawns on top were perfect, half-cooked when the bowl was brought to us which means they could finish cooking in the hot stock and we could gobble them up at their most tender and juicy. Wilted kang kong or water spinach added a very authentic touch. Yummy! My friend M went to Malaysia pretty much just to eat Hainanese chicken rice. He told me about one amazing restaurant where he went, ordered and ate and then went back to the counter and ordered another plate of the exact same dish. 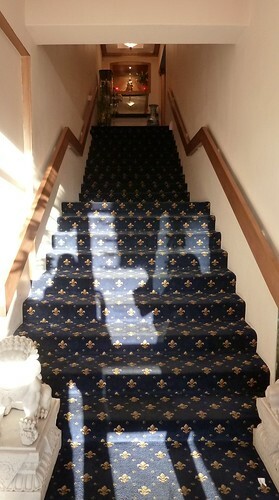 The staff were totally perplexed! 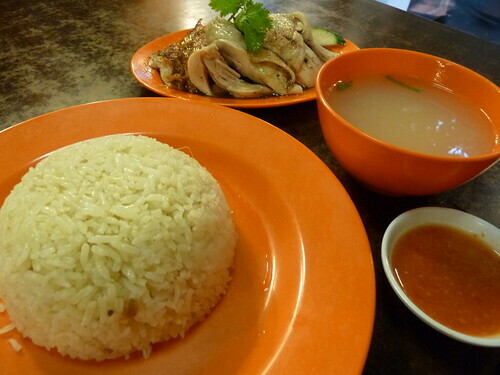 This is seriously amazing chicken rice. The BBQ or "black" chicken had lovely dark glazed skin while the Hainanese chicken was incredibly delicate and juicy, scented with ginger. The light sauce or dressing it sits in is just amazing, sweet, light yet rich. The rice is very much a part of this dish, cooked in chicken stock with ginger and a little chicken fat. The chilli sauce is another integral part and is light and somewhat thin - I think it is more like pureed red chilli than a commercial sauce. 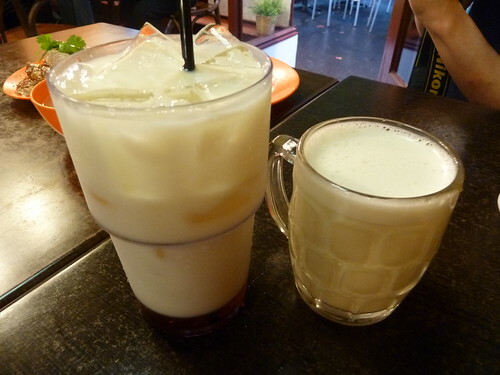 I can't wait to go back to try more Malaysian goodies but the first thing I will always order is the homemade soy milk. I had the chilled version and it is totally divine. It's much thinner than commercial soy milk and actually tastes like tofu, a sweet liquid silken version. So refreshing yet so healthful. Apparently it is freshly made daily, is 100% natural and from Australian-grown beans which means no GM. 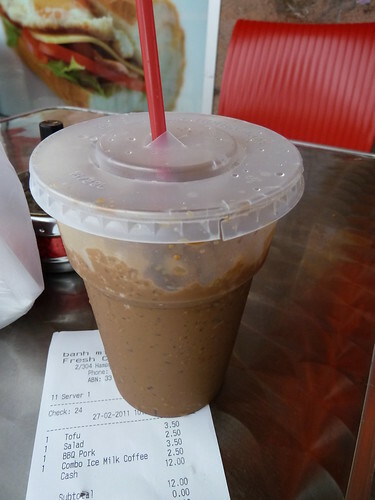 Cendol is a kind of dessert/drink - Bryan was surprised this was served in a glass as he has normally seen it in a bowl. 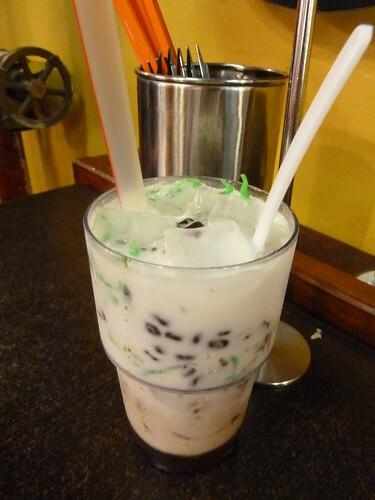 Little green worm-like mini noodles bobbed amongst tiny jelly cubes and ice in a long, cold glass of coconut milk. All of this levitated above a dark and mysterious layer of gula melaka or palm sugar syrup. I can't get into the bubble tea thing of sucking solid things up a straw but I loved the coconut milk - so simple, so cool and creamy. The little bits and pieces were fun to eat with a spoon. So what was the universe trying to tell me? It may be a bit rough around the edges but Coconut House has great grub. I think the message was just as simple as that.